With finals upon us and winter break quickly approaching, we wanted to inform our patrons that we’ll be having some work done at WIC over winter break. From December 27th through 30th, the library duct systems will be cleaned, which means that WIC will be chilly, noisy, and possibly overtaken by workers in certain booths and rooms. Even though WIC will be open (but not staffed) those days from 8:30am to 5pm, we’ve taken all of the bookings for the booths, group study rooms, and the WIC Seminar Room offline in case our workers need them. Anyone using WIC is more that welcome to sit in a booth or room, but please know that if the workers need access to any areas, they may ask you to move. Please feel free to get in touch with us at wic1@pobox.upenn.edu with any questions. We wish everyone a happy holiday and restful winter break! Remember when we rang out the old? Our new Data Diner booths have arrived. As promised, we have a bold new pattern. Here is a photo (taken by our own David Toccafondi) of Chris Vandegrift and Natalie Lyon checking out the new digs. Our thanks to John Brilla for a super-smooth transition from old to new! Our twelve Data Diner Booths went out for upholstery just before winter break. Our new booths should be back in place by January 6. Look for a bold new pattern in 2014! You’ve probably noticed the “Caution” tape in the WIC. No, they’re not filming a scene for CSI Philadelphia. 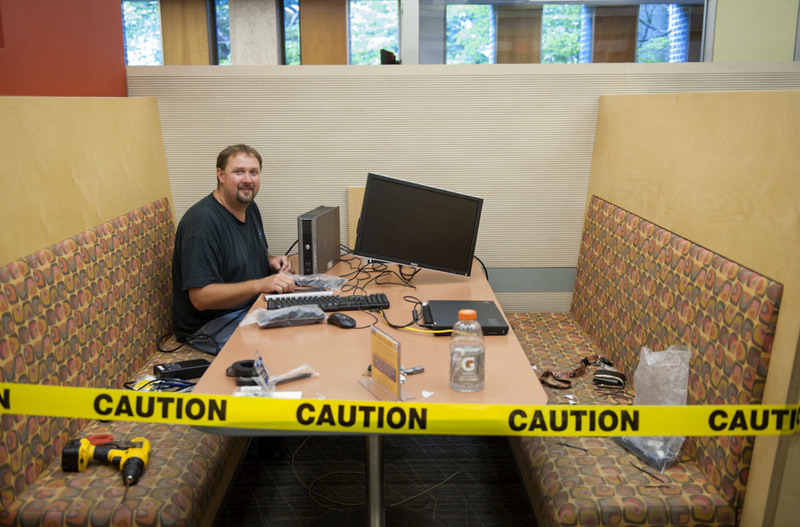 We’re just spending some time straightening up the booths and study rooms and Digital Media Lab to make sure everything’s in working order before classes begin. This is T.J. You’ll see him doing a lot of this work out in the WIC, and we’ll re-open the booths and rooms as he completes work on each one. We’re hoping to have everything wrapped up by the beginning of next week. We’re sorry for any inconvenience that the temporary reduction in study space might cause. If you have a hard time finding a space to work in the meantime, talk to the person staffing the WIC service desk and we’ll see what we can do to help.